A couple of interesting scientific stories are making the rounds today, and worth a little physics and general science commentary. The first reminds us just how incredibly limited our sensory perceptions are in telling us about the world, by forcing us to imagine how it may look to animals whose perceptions are slightly different. The second reminds us just how little we know about our own planet. One story that got my attention is that apparently the flashes of ultraviolet light randomly emitted by insulators on electrical power lines are visible to many mammals with whom we share the planet. And these flashes, up and down a long power line, may be scaring the heck out of them. Visible light occupies a tiny part (vastly overestimated in this picture!) of the immense range of wavelengths over which electromagnetic radiation is found in nature, which extends from a good fraction of the size of the universe down to distances far smaller than an atomic nucleus. A nanometer is 0.000,000,001 meters, or about 3 times the size of an atom; we can see only light waves with wavelengths in a small range around 525 nanometers. Many animals can see light that lies a bit to the left of our visible range (i.e. 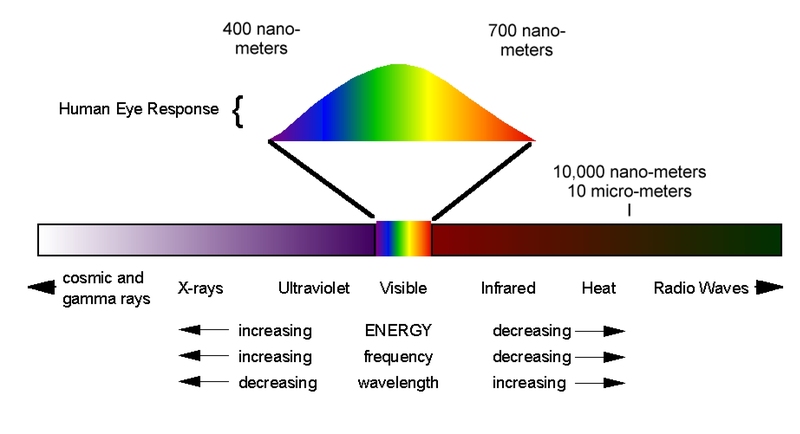 at smaller wavelengths, “ultraviolet”) than humans can see; others can see some infrared light (to the right of our visible range, at larger wavelengths). Picture from http://www.lpi.usra.edu/education/fieldtrips/2005/activities/ . That slightly broader range of vision is apparently enough to make power line flashes visible to their eyes. It’s been known that reindeer and other animals have been widely avoiding the areas with power lines, with the effect of fragmenting their habitat and populations (which can endanger them), but it hasn’t been understood why. Now it is suggested that these flashes might be the reason. There may be similar effects on other animals in other places, because it turns out that humans and monkeys may be unusual among mammals in not being able to see this slightly ultraviolet light. It may therefore be important, on environmental grounds, for power companies to prevent these flashes completely, which are caused by a buildup of electric charge that is suddenly released into the atmosphere. It’s yet another example of the many unexpected and unintended consequences of modern life… and of the limitations of perceiving the world with only human senses. Next comes the report that a major step has been taken in the debate as to how much water is stored in part of the Earth’s interior. Using earthquake waves as a probe over the past century, geologists have assembled a picture of the Earth (which has a radius of 6400 kilometers [4000 miles]) as consisting of a core of radius of nearly 3500 kilometers, and a mantle, extending from the top of the core nearly to the outer edge of radius of about 2900 kilometers, with a thin crust (typically 10 to a few tens of kilometers [6 – tens of miles] thick) on which all the continental land and oceans rest. The dense material in the mantle is in some ways like a solid and in some ways like an extremely viscous liquid that can be squeezed and deformed very slowly. (Caution: that’s a quick over-simplification; the mantle’s more complex than that.) The mantle’s details are probably still incompletely known, but there is an upper region extending from the crust down to about 410 km below the surface, and below that is a “transition zone” (410–660 km below the surface, or from about 5710 km to about 5960 km from the Earth’s center), which separates the upper and lower mantle. There’s been a long-running debate as to whether the transition zone has a significant amount of water, perhaps dragged down from the ocean floor via the process of subduction. And just recently there’s been evidence (which I’ll describe in a moment) that the watery point of view is correct. In the reporting on this story, a small number of press reports about this have actually bordered on saying that the Earth is now thought to have an underground ocean! Not so. A somewhat larger fraction of the press reports have said there’s an underground “ocean”, whatever those quotation marks are supposed to mean. Either way, it’s pretty misleading. If the water actually is down there, it’s not stored as liquid water. It would be stored in “hydrous” minerals, which contain water not as droplets or pools or puddles but by incorporating individual water molecules into their molecular structure. An example of a hydrous mineral is opal, which certainly isn’t a puddle. Also, an “ocean’s-worth” of water may sound like a lot, and in a way it is a lot, but then again, not that much relatively speaking. Let’s do a little calculation to see what we’re talking about. Right — the ocean looks big, but the Earth is 1000 times bigger by volume. So that means that even if an amount of water equal to the earth’s oceans is inside the mantle’s transition zone, it is only (by volume) about 1% of the volume of the entire transition zone, and about 0.1% by volume of the Earth as a whole. Since water is less dense than rock (i.e., it has less mass for the same volume, which is why it is easier to lift a cup of water than a cup filled with rocks), the stored water is a lot less than 1% of the mass of the transition zone, etc. The new story this week is that a small ugly diamond from deep underground has been found to contain a tiny, tiny crystal of blue ringwoodite (a very-high-pressure modification of olivine, containing magnesium, iron, silicon and oxygen). As often happens, the discovery was an accident; the geologists were studying the diamond for another reason. 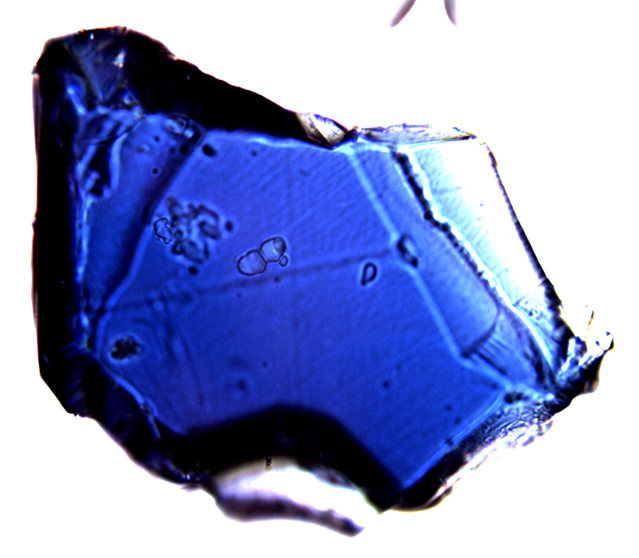 Ringwoodite, a beautiful blue crystal, is expected to form geologically only in the mantle’s transition zone, because of the extreme pressure required to make it. This is the first geologically-produced ringwoodite ever found, and as direct information about the transition zone, it has geologists very excited; maybe, if they look harder, they’ll find many more examples. Synthesized ringwoodite; from Wikipedia commons. Moreover, ringwoodite is a hydrous mineral, and this tiny ringwoodite crystal turns out to have a small amount of water incorporated into its structure. And that connects us to our watery story. From this one tiny piece of evidence, a huge claim has been made that the entire transition zone must be 1% (or so) water, and that therefore there’s as much water down there as all the world’s oceans. Or so says the media based on the claims of at least one of the scientists who discovered this evidence. But a non-expert like me is bound to ask: shouldn’t we have a bit more evidence before drawing such a sweeping conclusion? All we could possibly know so far is that at least one part of the transition zone has water incorporated in it. That’s still interesting, and a strong argument against those who’ve argued that the transition zone has virtually no water in it. But for all we know, the transition zone may have a highly variable water density, and so there’s simply no way to draw a conclusion about its total water content from one crystal from one location. On purely logical grounds, we can’t yet have confidence that there’s an ocean’s-worth of water in the mantle’s transition zone… despite what the media’s been saying and that Pearson is implying. After other scientists have found a few more blue pieces of evidence from completely different locations and found that most or all contain water, then maybe we can start to infer something about the transition region as a whole. In any case, one shouldn’t go around thinking of the planet as made of water. Even if it turns out to be true that there’s as much water in the mantle as there is above ground, we’re still talking about a few tenths of a percent of the planet’s volume, and even less of its mass. Even if it might be a tiny bit wetter than some scientists thought, it’s still a rocky planet. This entry was posted in Evolution and Biology, Geology and tagged earthquakes, environment, geology, light. Bookmark the permalink. The fact about UVA flashes from power lines is interesting .I remember few years back there was a scare that people who live near power lines had a higher incidence of cancer. The people who proposed it could not prove it for the simple reason that biological effects may take some 30 years to manifest. So the power companies simply brushed it aside. Do you think the proponents of cancer theory considered UVA or is it a new discovery? If I remember right, this was from a physicist or electrical engineer from Pittsburgh. I don’t see how bright flashes of light from a hundred feet away are going to make you sick even though they might scare you. They won’t penetrate past your skin. Ultraviolet light from power lines couldn’t possibly cause anything other than surface damage (skin cancer and cataracts)… it’s not going to cause internal problems. And it certainly isn’t going to bother you when you’re inside your house. There may be a real effect, but it’s likely psychological. If people are worried about power lines causing health issues they are likely to become stressed. Stress causes health issues, and may lead to behaviors which increase the risk of cancer, such as smoking or increased alcohol use. Even if it doesn’t cause you to increase risky behaviors for cancer it does directly weaken the immune system, and some opportunistic viral infections have been linked to cancer. Attempts to determine the danger of power lines (or anything else) need to take the perceived danger into account as well. In some cases the real danger will be significantly lower than the perceived danger, and “theatrical” fixes that purport to solve the problem without actually changing anything will actually have a beneficial effect, due to reducing stress. To Matt:It (=if power lines cause health problems) depends on how they are interacting with and imparting energy to its surroundings (including with which energy range, what type, how often? at what density, etc.). For example, are we sure that they only emit UV within those measured already or they could emit electromagnetic waves in other range (higher or lower frequency outside of UV range) even though only occasionally? They should measure broader energy range, how often they are observed, and in which directions they are more likely to find the radiation off the line or parts of pylons. (“..but the cameras only record a very narrow range of UV.” http://www.theguardian.com/environment/2014/mar/12/animals-powerlines-sky-wildlife) It should be determined which (biological and other) molecules absorb how much energy from electromagnetic radiation at what wavelength, probability and if this changes any molecular structure. “..couldn’t possibly cause anything other than surface damage (skin cancer and cataracts).” “..it’s not going to cause internal problems” -> sounds imprecise or possibly incorrect. Depending on the frequencies, they can penetrate deeper. And, even if they cannot penetrate deep and damage tissues directly, they could affect health via secondary mechanisms like ROS generation, UV-induced cytokine release from affected surface area (=skin and a bit beneath) and UV-induced immunosuppression etc.). To Matt:is the claim of the following paper (“Why arguments based on photon energy may be highly misleading for power line frequency electromagnetic fields” http://www.ncbi.nlm.nih.gov/pubmed/?term=11255216) valid or consistent with your understanding of quantum electrodynamics/standard model? (yes/no:how so?) particularly: “There is in principle no difference in how much energy an electron can pick up from a low frequency electric field as compared to from a high frequency photon. Thus, the total gain in energy is not limited to the energy carried by a single photon..” ->true? how so? Do near-field light/photon (=evanescent light? =non-propagating light?) behave and interact with electrons/molecules/materials very differently from how propagating light does or what is predicted by quantum electrodynamics/standard model? Could an electron(s) inside biological tissues (or any common molecules in air, building, clothes etc.) pick up enough energy(=be excited) via resonance etc. under fluctuating EM field (around power lines) to release photons in UV or higher energy range occasionally? Or, could such fluctuating EM field break chemical bonds or add sufficient energy to the electrons in the bonds to alter the (biological) molecular structures? My recollection is this power line/cancer association was conclusively refuted by some long-term, Scandinavian epidemiological studies. Especially due to the incredibly stringent requirements for evidence that must be met for a discovery in physics to be considered real. Which isn’t to say that there aren’t quite a few theories in physics which are popular but unsupported by evidence. There’s nothing wrong with that, as long as they don’t get treated as theories do in other fields of science. Physicists tend to use a definition of theory much closer to that used by mathematicians, so if there isn’t math it’s a hypothesis, if there’s (working, consistent) math it’s a theory, and if there’s good evidence it’s a supported/well-supported theory. Some, like the multiverse theories, will likely never be supported by evidence, since they predict things which can never be detected even if they exist. Others are theories of totally imaginary worlds, known to be unlike the real world, but which provide interesting mathematics and can help solve problems in the real world. N=4 Super Yang-Mills is probably the best-known example of this type of imaginary world. So physicists do extrapolate from flimsy evidence, but that doesn’t imply that such extrapolations are generally accepted as finding the real way the world works. Matt, you are right that a new far-reaching “discovery” is frequently published without a careful analysis. Probably the “publish or perish” is at work. You have analyzed the ringwoodite diamond claim. Regarding a powerline corona discharge claim, I expect most of optical energy to be emitted in 1 eV to 3 eV range, infrared to optical (ionization energy of air molecules). There is of course a UV component as well, but how scary it is to a reindeer deserves more research. Conservation biology is for me connected to Prof. Paul Ehrlich of many predictions. Paul R. Ehrlich’s beliefs and alarmist predictions of “unsustainable” population growth and “limited resources” have proven spectacularly WRONG. Say, Matt, I want clarification on something you said in another blog post fairly recently, about Stephen Hawking’s expression of new ideas on Black Holes. I believe you said that his statements were not a Theory, because they did not include calculations, equations. Is that correct? If so, what does that say about Evolution? Calculations, equations? The theory of evolution has quite a few equations and calculations! More than you care to learn about, I’d imagine. Which is probably why you haven’t. But the real problem is that the equations you should use are extremely complex coupled partial differential equations — which are beyond what anyone can easily solve. This makes details of evolutionary theory hard to check. This is why the theory, though well-defined, can only be checked in certain contexts. Equations are very actively used in genomics, which is used to track certain processes in evolution. That’s why Eric Lander the mathematician, Leonid Kruglyak the former physicist, and many others with mathematical backgrounds have risen to prominent roles in these fields. Any notion that evolutionary biology and its related fields lack math is simply due to the fact that the subject involves such difficult math that progress has been limited, and therefore (unlike particle physics, where the math you have to solve is much easier and progress has been much more rapid) it is still possible to describe much of the subject in words. But this has been rapidly changing in the last twenty years; modern advances in evolutionary biology are already beyond this point. So called stray voltage has been known to affect the health and milk production of dairy cattle. That of course has nothing to do with ultra violet light, but stray voltage could also be sensed by some animals. What it may or may not do to human health I don’t know. Stray voltage has the same effect on everybody: it shocks you. If you notice any stray voltage, you should notify the power company. If they refuse to fix it, I’d suggest legal action. That is something that really should not happen. How hard is it to eliminate the corona discharge effect completely? I know they use all kinds of spines and metal shapes to dissipate it, but can those eliminate it completely? Would the cost be prohibitive? Actually, spikes do cause corona discharge – you try to get rid of them: if a tip of a long spike has a radius R, the electric field is proportional to 1/R**2. Frequently utilities use 3 parallel wires arranged in a triangle, that homogenizes the field. Next, you can decrease the voltage under a “corona onset voltage”, but then you limit the power transmitted. Finally, you can use DC instead of AC, because AC has 2 peaks in each period. Prof, does quantum entanglement suggest a single point (singularity) of origin of the universe and if so that there is a unification theory? Are fields plane waves are can they be confined to a spherical volume and propagate from the center outwards and back again. Much like a 3D ripple on a pond. If so, would this spherical oscillating field create a negative force “outside” it’s confined volume, much like a massive shell, the G force anywhere inside is zero which any mass outside obeys -Gm1m2/r2 law? 2) Yes they can be confined to a spherical volume under the right conditions. 3) No this doesn’t create a negative force outside. Sorry Matt. Nothing appears anything to our brain , there are no end of the line sensation IN the brain , so what you said should be read : ” Which appear violet to our Mind “. Matt’s “Fine” as in: no point in engaging. That power-lines information is Intriguing… I have a modified camera (350-1000nm) and a shortband UV pass filter (320-390nm). What do you think my chances are of capturing it? Sounds like it should be pretty good. I assume we’re talking here about insulators on the big high-tension long-distance power lines. Make sure the line carries power – you should hear faint cracking sounds caused by the discharge. In college, I used to see flashes at night, in an area where the only things around were the “telephone lines,” and the little observatory. I always saw them in peripheral vision. Perhaps my young eyes were picking up UV flashes? Interesting stories Matt. (I wonder how long it will take those who literally interpret certain religious texts to latch unto the water beneath the Earth story). As to the UV emissions, I knew that bees and butterflies can see in UV, but I did not know that deer could. Now that I read about it I see that even dogs and cats may be able to see UV that humans cannot! I have also heard that even ordinary camara film can pick up UV that humans cannot see. From what I understand UV from 400 nm down to ~340 nm is basically harmless. UV lighting in bars and clubs operates in the 360 nm range. Many birds have 4 “cones” in their retina (we humans only have 3), with one being clearly optimized for UV reception (see the figure in the link below). I imagine that to the birds (I live with parrots) the colors in our interior lighting, windows, photographs and TV screens all appear to be “off,” much as if we lived our lives behind rose-colored glasses. Still, the posts are very brief ffor novices. Coukd you please extend them a bbit from nest time?